FightHype.com brings you closer to the fighters with this unique series. Go beyond the hype to find out what makes your favorite fighters tick. From favorite movies, music and shows to childhood heroes, you'll get an inside look at their life outside of the ring/cage. 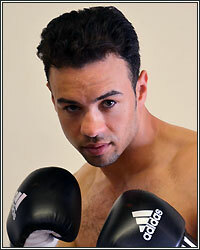 So without further ado, get to know jr. middleweight contender Delvin Rodriguez. If you weren't a fighter, what would you be doing? My mom's rice and beans. I pray to God to give me strength, and I open up my mind. If you could fight anyone in time, who would it be? When my mom went back to the Dominican Republic to bring me and my sister back, and when my son was born. Waiting for my mom to come get me and my sister from the Dominican Republic as a child. Getting in trouble in school for walking out of class without permission to go to the bathroom. I didn't speak English; wet my pants. Bonus: Name something that most people don't know about you? I'm a sentimental guy who likes to write Spanish love songs.